Wedding rings are a traditional part of the modern wedding ceremony. They’re most often worn on the left ring finger to indicate that the wearer is married, although in some countries it’s worn on the right ring finger. 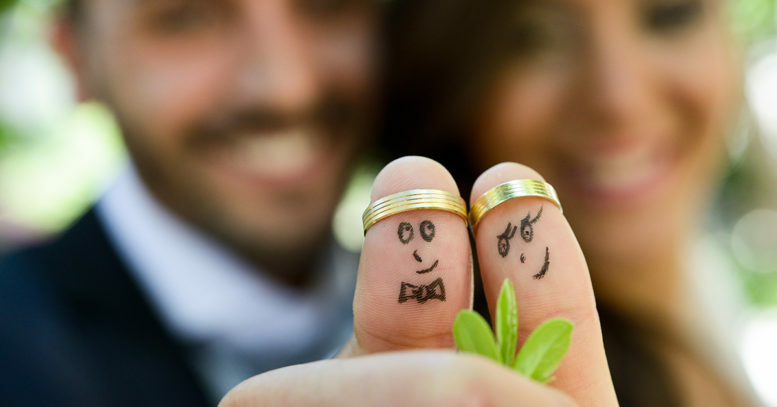 For many couples, one or both partners have made the decision to not wear a ring at all, making it an optional, rather than compulsory part of the wedding ceremony. But where did the tradition to wear a ring originate from and has it always been signified by a metal band? Traditionally, a wedding ring was forged from 22 carat gold or other precious metals. However, during the second World War, the manufacture of jewellery was restricted, so ‘utility’ rings were created from the lighter weight 9 carat gold. These were limited to a mass of no more than two pennyweights – making each ring a little more than 3 grams in weight. Each of these rings carried a special utility mark (it resembled a capital ‘U’, but with the bottom curve missing), hallmarked by the Regional Assayer Office and placed adjacent to the mark for the year, on the inside of the ring. It is believed that the exchanging of rings originated from ancient Egypt, when braided rings of hemp or reeds were given to symbolise perpetual love between the spouses. 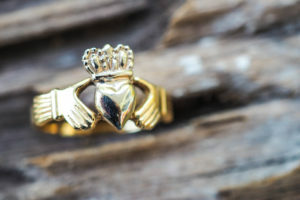 The Egyptians considered the circle to be a symbol of eternity and the ring was worn on the left ring finger, as this finger enclosed a special vein that’s connected directly to the heart, known as the Venus amoris. Precious metal rings can be traced back to the Roman and Greek times. They were given as part of the marital dowry and symbolised the promise of fidelity. Most often, it was the wife who wore a ring – it wasn’t until the 20th century that the husband also wore one. The precious metals were a sign of the permanence of marriage. The style of ring has also changed over the centuries. During the 16th and 17th centuries, European husbands gave the wives a gimmel ring. This consisted of two interlocked bands, and the bride and groom each wore one of the bands during their engagement – the bands were then reunited at the wedding ceremony, when the wife would wear both. Another popular European ring was the Fede Ring. This was a band consisting of two hands clasped in betrothal. During the renaissance era, the poesy ring was popular. This was a sterling silver band, inscribed with a poem or poesy. In the middle east, its customary for husbands to give their wives a puzzle ring. It was a complicated ring comprised of several inter-joining pieces that, when properly assembled, could be worn as a ring. It was therefore difficult for the wife to remove, without her husband knowing! The exchange of rings – a rather finance-orientated affair! Traditionally, the exchange of rings during the wedding ceremony was never about the love between a couple. Instead, it was a contract between two families and connected to the exchange of valuables! The wording for a ceremony used to be: ‘With this ring, I thee wed. This gold and silver I give to thee.’ It was at this point that the groom would hand over a purse filled with gold and silver for the bride. It’s considered a far more romantic affair now! Husbands and wives often both wear a ring, to symbolically declare their life-long love for each other. It’s also seen as a matter of both tradition and etiquette to wear a ring – without one, you’re considered single and available!